Mayhem Studios, award-winning design firm featured in Jamie Freeman's book, 500 Simple Website Hints, Tips, and Techniques. Make Up Media and the Studios' own website design will be included in the book. 500 Simple Website Hints, Tips, and Techniques is currently in book stores. You may view the table of contents HERE. 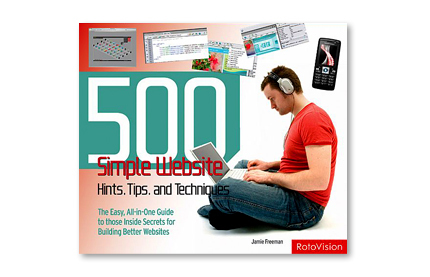 500 Simple Website Hints, Tips, and Techniques is a jargon-free handbook on the basics of website design. The book offers advice on planning your site, with an introduction to information architecture, tools, scripting basics, file and image formats, choosing and buying a domain name, and methods of testing websites. Key design aspects, such as colors, typefaces, and rollovers are also explored. The book includes essential advice on following web standards, ensuring a site loads quickly, achieving a high ranking on search engines, and offers tips on marketing strategies. Once you’ve got a website that works and can be easily found, the book explains the best way to add creative and fun extras, such as Flash animation, movies, audio, blogs, and podcasts. Jamie Freeman is a website designer and has also written several articles about designing for the web. He currently works for Message, a company that designs and builds websites. He lives in Hove, UK.